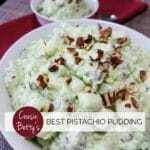 Cousin Betty’s Best Pistachio Pudding Recipe – you’ll love the combination of sweet and salty flavors in this sweet retro salad. Combine the dry pistachio pudding mix with the undrained crushed pineapple in a large bowl and mix until well incorporated. Add mini marshmallows, chopped pistachios and Cool Whip. Stir gently to combine. Reserve a tablespoon of chopped nuts for garnish. Serve with a dollop of whipped cream and maraschino cherries. Makes a pretty side dish for the Christmas holidays.